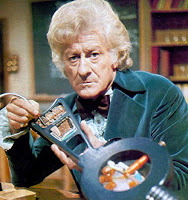 It’s The Third Doctor’s final year, and Trine-E and Zu-Zana’s work is nearly done. But is The Doctor heading for a regeneration in style? 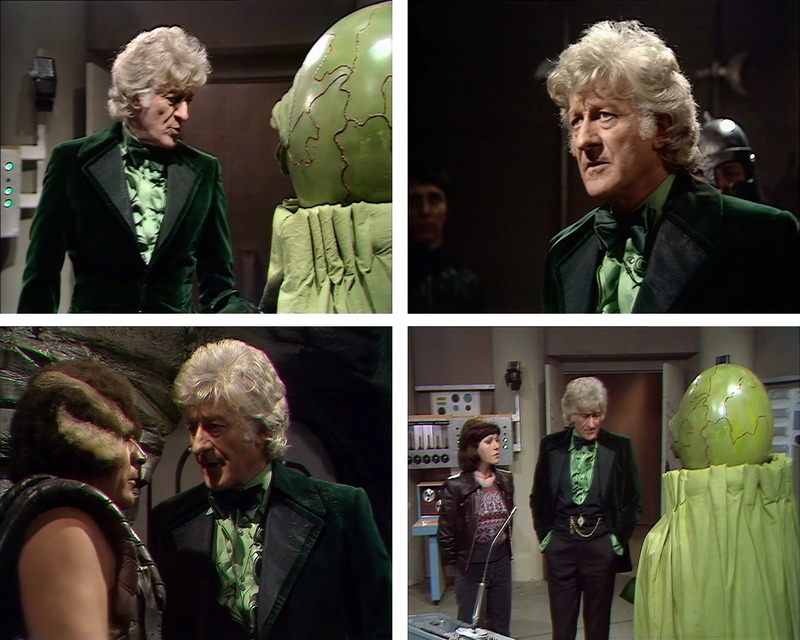 The Doctor kicks off his final season wearing a simple costume of the two-button fronted bottle-green velvet smoking jacket with large collar and lapels, first worn in Carnival Of Monsters the previous year; a frilly apple-green shirt; and dark green velvet bow tie (see below). 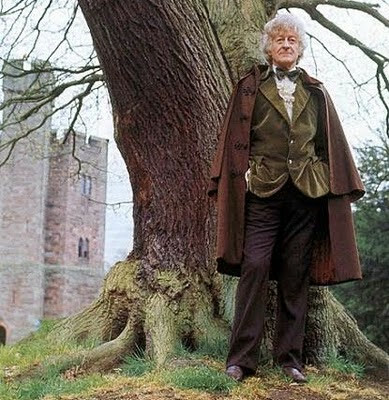 NB: The publicity still below shows Jon Pertwee wearing the brown Inverness Cape from Carnival Of Monsters, with the cape draped over his shoulders rather than worn properly. This is an erroneous shot as this Inverness Cape is never worn at anytime during The Time Warrior. This adventure sees a completely brand new, and one-off outfit. He wears a two-button fronted aquamarine-blue velvet smoking jacket, with large collar and lapels; a pale blue frilly shirt; and a navy blue velvet bow tie (see below, right). For the outdoor scenes he adds a one-off grey checked Inverness Cape with a mid-blue lining (see below, left). 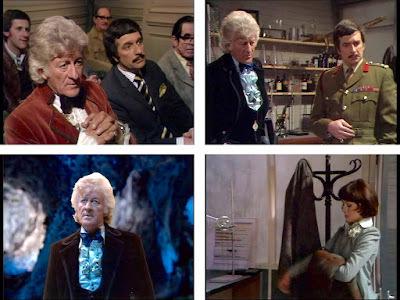 The smoking jacket is almost exactly to the same pattern as the bottle-green one he worn in the previous adventure, though to a different colour. For his next outing, he bring back out of the wardrobe the emsamble he wore for latter part of The Green Death: a button-fronted petrol-blue velvet smoking jacket with red-piped revered lapels; a red velvet waistcoat; with a blue-grey frilled shirt; and a burgundy silk bow tie. For Jon Petwee’s penultimate story we have yet another new velvet smoking jacket, this time in deep emerald green, with large collar and silk-fronted lapels; with an apple-green frilly shirt; and a emerald green velvet bow tie to match his jacket (see below). All very co-ordinated! For his swan-song The Doctor start off wearing his rust-red velvet smoking jacket (see below, top left) with a notched collar, black cord piping, with a triple frog-fastening that first appeared in The Curse Of Peladon and reappeared in The Three Doctors; a button-fronted frilly shirt, with large collar; and a black velvet bow tie. As soon as he is back in the office, he quickly changes to a charcol-black notched collar velvet smoking jacket, with black piped edges; a pale blue/green frilly shirt; and a dark aquamarine blue velvet bow tie (see below, top left and bottom right). 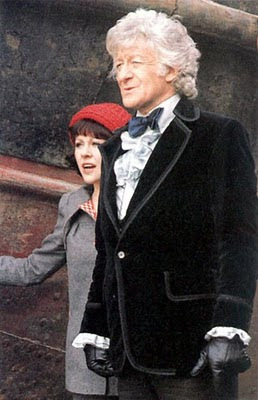 In a nod to his older costumes, just before the reappearance of the TARDIS for his regeneration, Sarah-Jane takes his red-green Inverness Cape (first seen in The Curse of Peladon and The Green Death) from the coat stand to hug it. Also on the coat stand is his Inverness cape from Invasion of the Dinosaurs from earlier in the season (see above, bottom right). This last season, compared to the earlier ones, is rather a contrast. To start with he was rarely parted from his precious Inverness Cape – but this year he hardly wears one (only in Invasion Of The Dinosaurs for some scenes). He wears six different smoking jackets, over five adventures. Doctor! What can we say? You get everything right this year. Mixing and matching those great colours and patterns with textures and chic. Following those simple rules and getting away from all that black makes you look 300 years younger! You just need to refresh for next year. We hear floppy hats and long scarves are in. The smoking jacket will be so out next season. Shooting jackets will be the next big thing. Mark our words! any review of the later purple jacket,black chord with Grey Inverness cape with purple lining ? 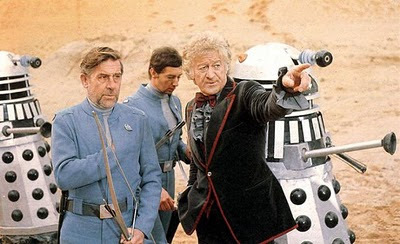 The purple jacket was in Planet Of The Daleks in the previous season. Not sure that inverness cape you mean there. Which story is it in? I'd like to make this index comprehensive and complete, so let me know. Funny that he only wears bow ties in this season.